I needed to see something finished. 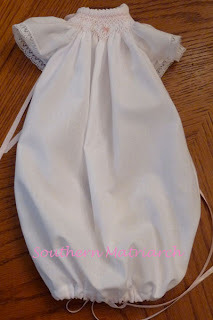 I had smocked a Wee Care gown last week in the car on the way to Springfield. I grabbed it yesterday and stitched it up real quick. Took about an hour to stitch together. 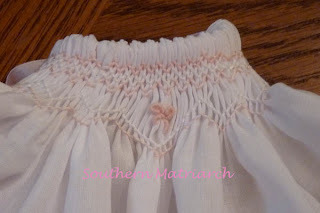 When you are working on something that feels like it will never be done, like a linen daygown, you just need to see some results. But, it is sweet and done and I feel like I finished something. Very sweet and looks absolutely perfect! Thanks guys, I love doing Wee Care gowns. Love it.. cowlick and all!